We have many kittens of all colors available. There is also an assorted selection of adult cats. Adoption fees range from $70 to $100. 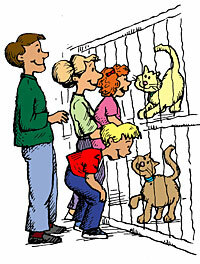 These fees cover medical expenses such as, spay/neutering, testing for feline diseases, shots, medication, etc. Come in and visit us M-F 2-6pm at 1125 Old Dixie Hwy, Lake Park, FL 33403 or call 561-848-4911/307-3962. Pet Supplies Plus on Northlake Blvd. in the K-Mart Plaza every Saturday (10a-7p) and Sunday (10a-4p). Pet Supplies Plus on Lake Worth Road in the Home Depot Shopping Center every Saturday (10a-7p) and Sunday (10a-4p). Petsmart on Congress just south of Northlake Blvd. every Saturday (10a-5p) and Sunday (10a-4p).